Home » How to Ask your Query? This blog is all about helping people out with PC Hardware & Components, Smartphones, Laptops, Gaming, Apps and Internet Tools. You can ask your queries related to the topics in this blog by following the steps mentioned below. 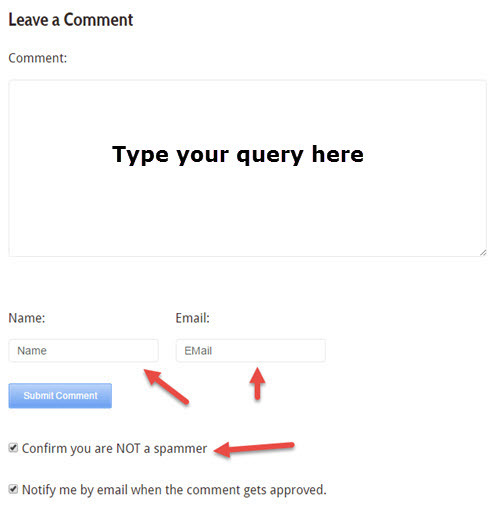 Here is how you can ask your query on akshatblog.com and clear all your doubts. 1. Locate the blog post related to your query. You can use the search box on the top of the right sidebar to search the desired article or post. 2. Read the blog post and then go to the comment section at the bottom of the post. 3. In the comment section type in your query or question. 4. After that enter your Name and your real or working Email address because the reply or answer to your query will be sent on this email address only. 5. Now check “Confirm you are NOT a spammer” and leave the next option as it is. 6. Click on Submit Comment button to send your query. Note: When your query is answered then an Email will be sent to you. Also you can see your response on the blog itself.